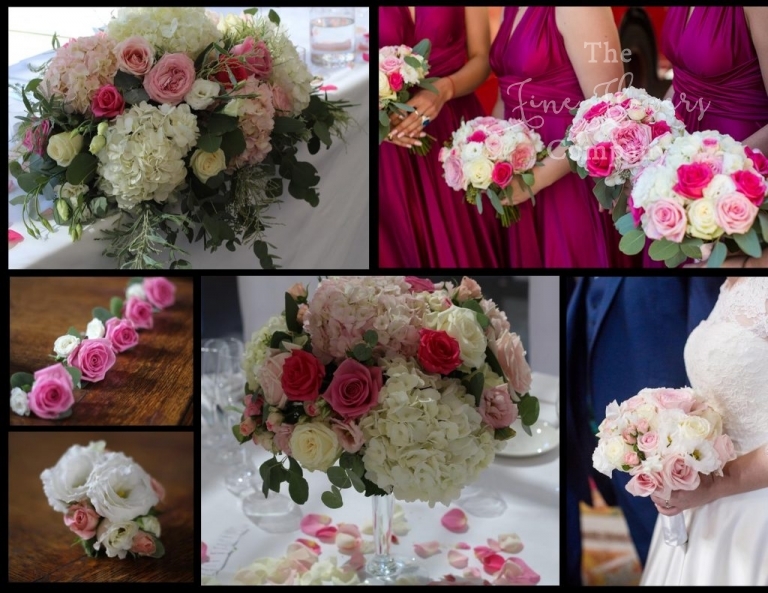 Having planned the whole wedding flowers for Anastasia and Iain’s wedding totally remotely, via Pinterest and email, and of course with the help of the wonderful wedding planner Lindy Dowling, I was so relieved to hear how happy they were with the wedding flowers we created. 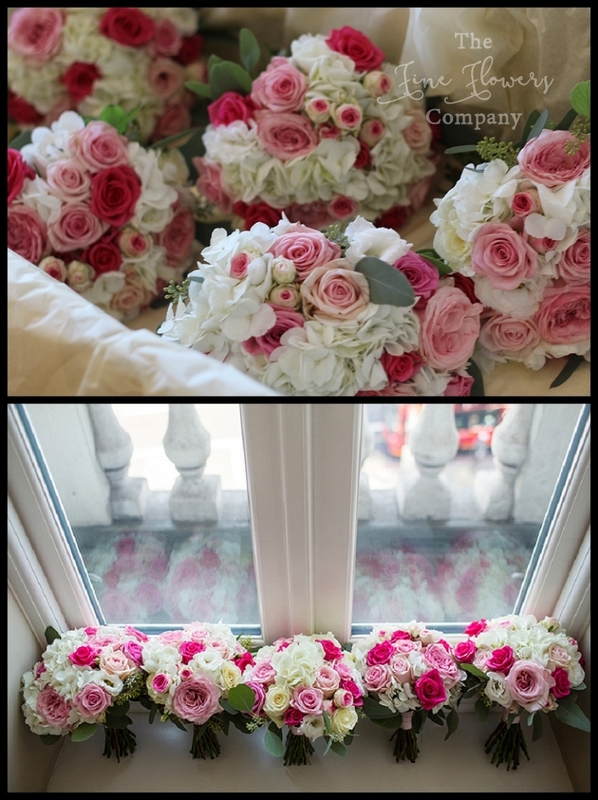 Anastasia opted to keep her bouquet lovely and pale, with a mix of hint of blush White O’Hara scented garden roses, pale pink Sweet Avalanche roses, sweet peas, lisianthus and blush spray roses, and injected a dash more colour in the bridesmaids bouquets. 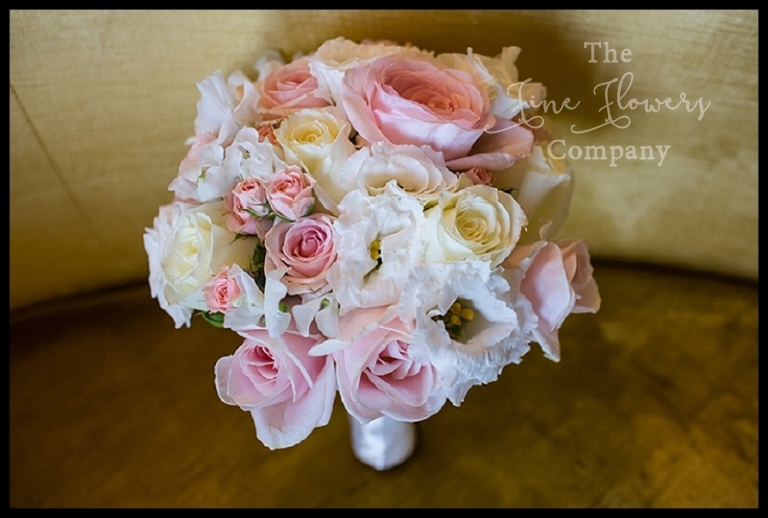 To their bouquets, we added splashes of Purple Power roses, Aqua and Sweet Dolomity roses, and very cute two tone Mimi Eden roses. The effect was really sweet against the deep raspberry / fuchsia pink dresses. The men wore buttonholes of pink Aqua roses, apart from Iain, whose buttonhole used a pale blush pink rose to match Anastasia’s paler bouquet. Anastasia and Iain were married at the beautiful St Sophia’s Church in London. Since the church is such a stunning example of the typically very oornate orthodox churches, it didn’t need many flowers to make it look dressed, so we focussed on the wedding aisle and styled that with posies of hydrangea, roses and gypsophila, which were later on brought back to Botleys and put to good use. Back in Surrey for Anastasia and Iain’s wedding reception at Botleys Mansion, the venue was dressed with pretty, over spilling and blousy displays in low Martini vases, with ivory and blush hydrangeas, a lovely mix of ivory, blush, mid pinks and deeper raspberry pink roses, and just a dash of silvery eucalyptus . I normally like to dress Botleys with a mix of tall and low displays or all tall displays, since the Atrium is so grand and tall ceilinged that it needs some added punch high up, but Anastasia and Iain much preferred to keep all guest table centrepieces low and create a more intimate feel around each table. The effect was really pretty and my favourite shot, was that of pretty ladies hats piled up high on top of one of the centrepieces, at the end of the speeches. The lovely photography is thanks to Binky Nixon Photography who very kindly shared some beautiful shots with me from this pretty wedding at Botleys Mansion. If you are planning your own wedding at Botleys Mansion and need some more inspiration on how to dress this beautiful venue at its best, both upstairs and down, then please our Botleys Mansion venue pages full of many featured weddings. There are some beautiful examples shown and all quite different so they are a useful guide to what works well at the venue.